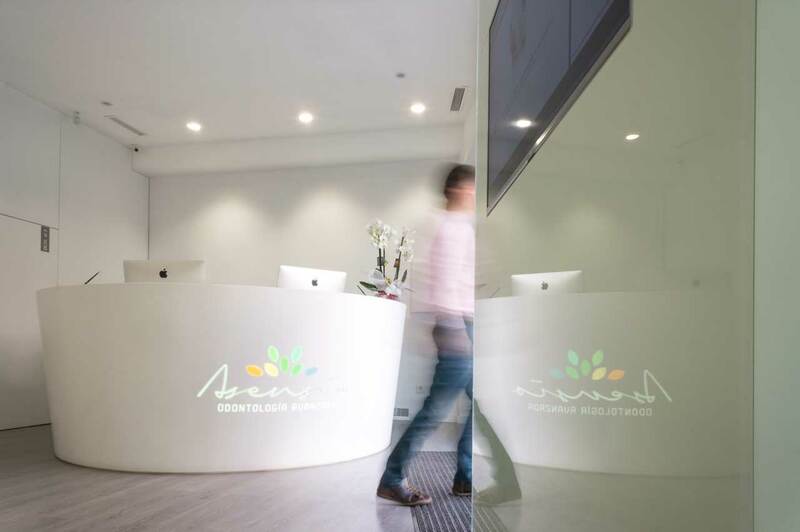 Advanced dentistry is the slogan chosen by Clínica Dental Asensio dental clinic, and once you have seen their facilities, you will realise that it is not just a slogan. Its futuristic aspect fits in perfectly with its latest generation instruments, professional attention and care for details, with which the compact mineral from PORCELANOSA Group, KRION® is combined. With 300m2 divided between 2 floors, 20 staff members, its privileged location in Avenida del Cid nº9, Valencia - Spain, as well as the 6 rooms, 2 operating rooms, latest generation apparatus and instruments, and experience acquired since 1997, Clínica Dental Asensio is a perfect place for a complete treatment. We can find KRION® in almost all the rooms of the clinic, the chosen colour being our star colour 1100 Snow White. The main reason why KRION® has been chosen is for its additive-free antibacterial properties, its curved form and sanitary joins. The main image of the clinic is a bar with a three dimensional curve created from 1100 Snow White, covering the rooms and operating rooms and bathrooms. This KRION® project was undertaken by VF Superficies Solidas.